PHILADELPHIA - The three young adults charged with beating a gay couple during a night out on the town in Philadelphia have been released on bail. 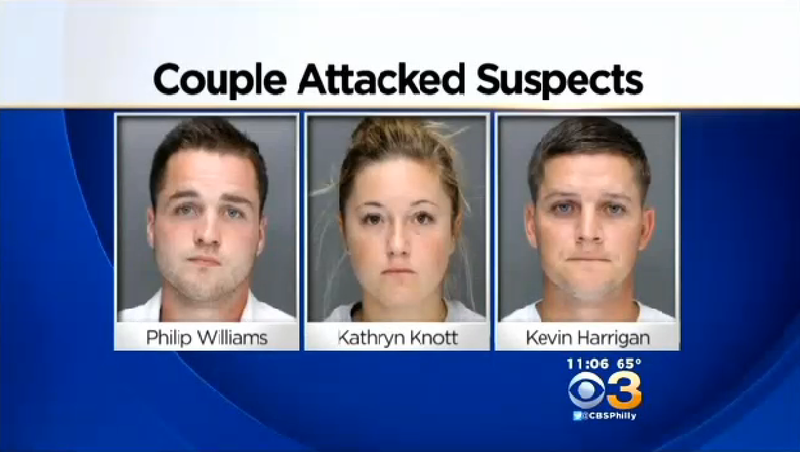 CBS Philly reports that 24-year-old Philip Williams of Warminster, 24-year-old Kathryn Knott of Southampton and 26-year-old Kevin Harrigan of Warrington left the police department's Central Detectives division at about 3:30 a.m. Thursday. Court documents indicate that Williams and Harrigan posted $75,000 bail and Knott posted $50,000 bail. The three are charged with criminal conspiracy and two counts each of aggravated and simple assault, and reckless endangerment. The couple told police a group hurled gay slurs and beat them when the two parties passed on a street Sept. 11. One man suffered serious facial injuries, including an orbital fracture, and had his jaw wired. Williams, Harrigan and Knott turned themselves in to police Wednesday morning after surveillance video was released showing them just before the attack.